This may be my most creative post title ever. I've written before about how my post titles are never good, nor creative, but hey... look at me now. Anyway... 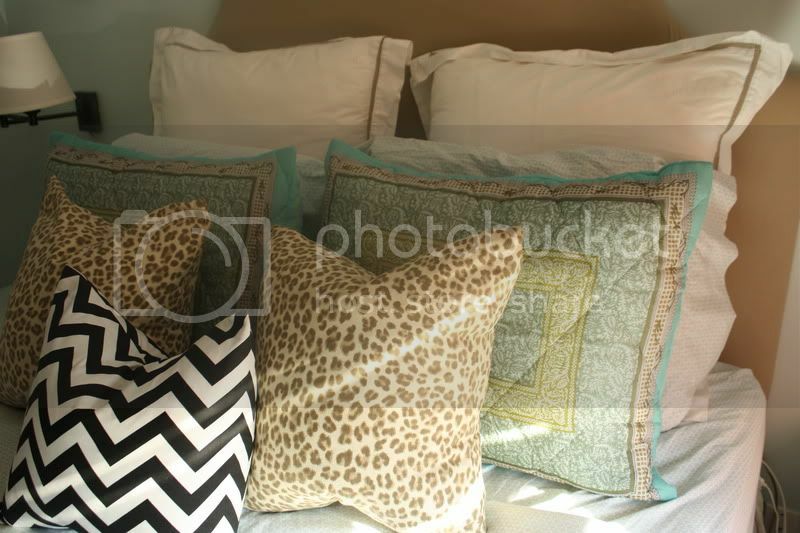 I bought some new pillow shams the other day, and really was diggin' the combo I've got going on in my bedroom now, so I thought I'd share. You like? I was drawn to that turquoisey pale blue -- it seems to be my color of the moment. Wait til you see new pictures of my living room - I've been incorporating it everywhere. I've always been a big turquoise fan, and I used to love to pair it with red. Again - my computer is messed up and not letting me save edited photos, so the white balance is off on these. I guess it's time to cave in and take it to the Genius Bar. 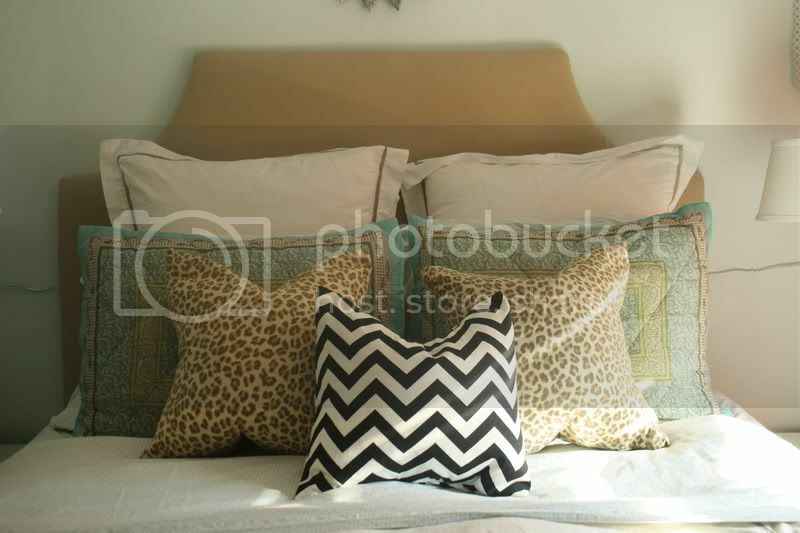 Anyway, for a summary, I bought the Zig Zag pillow in this etsy shop, the leopard ones in this etsy shop, the shams at World Market, the sheets are from Target (I love them!) and the bedspread and Euro shams are from Pottery Barn. I love changing up the look of things in my house with throw pillows... mine move all around the house, too. The fabric for my curtains is from Spoonflower - they are really fun and vibrant, and I love them paired with my pale turquoise walls. 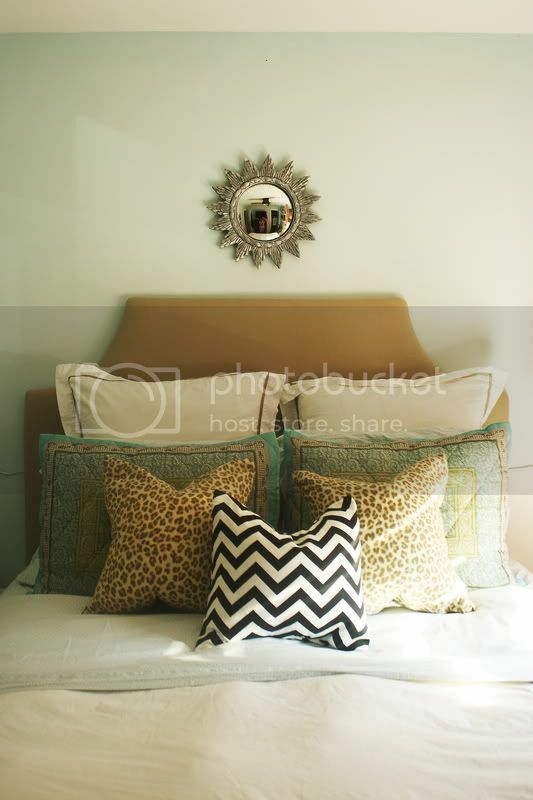 If you are new around here, you can read about how I made my curtains here, and if you're curious about that little sun-shaped mirror above the bed, you can read about how I bought it (then painted it) here. Actually - come to think of it, I have made or painted almost everything in this room. Hah! I painted the swing arm lamps from brass to oil-rubbed bronze, I painted the night stands (and wallpapered them! ), and I painted the sconces above the nightstands. I'm a crazy painting freak. I wanted to take a minute and say thanks to everyone for shopping my Joss & Main sale! It was a great success, and I'm hoping to host another in the future. If you missed it and still want to check out some goods (They have tons of great stuff - I love all the curated collections! ), head on over. Joss & Main is an invite-only website, but I have a special link for you here. I just saw some cord cover at the home imp store- I think it can even be painted - well, you know that- you can paint anything! 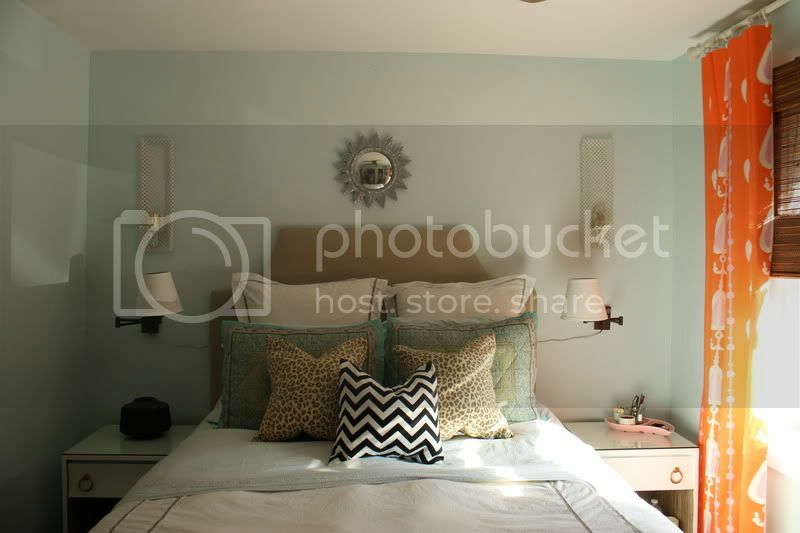 Love the room! Thanks for sharing! angeline- i'll have to check that out! I like your pillows. The color is so nice. I want these for my room.